Wow. As if Jeri Ryan was beautiful enough. The actual creator of the Comic Sans font, Vincent Connare, writes about the history of the font, and why it was created at Microsoft. Did you know that Comic Sans was developed specifically for the “Microsoft Bob” product but due to a mishap, it never made it into the product? It’s an interesting recap from the person closest to the font. I had a conversation internally at at the company with… well… someone I’d never even met about the ongoing tussle about Comic Sans. Apparently, there is an entire segment of society that just HATES this font while there is another segment that absolutely adores it. The folks that are humorously using the Comic Sans font in anything and everything. An NSFW humorous rant about why Comic Sans isn’t so bad. A ‘red herring’ quiz that was given to people about a completely unrelated topic that was actually a study about the use of fonts and it’s affect on people’s opinions. A research study that suggests that actually using more difficult to read fonts that lack serifs (such as Comic Sans) can increase information retention. A College Humor skit featuring Comic Sans. 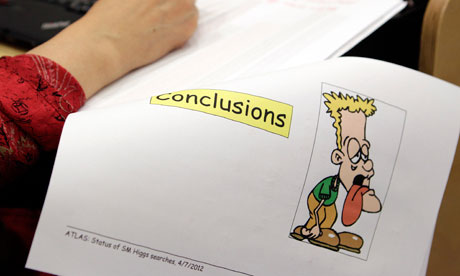 The hilarious coverage of geeks worldwide dismayed at the use of Comic Sans during the presentation on the discovery of the Higgs Boson “God” particle. You are currently browsing the Kurt's Thoughts blog archives for August, 2012.